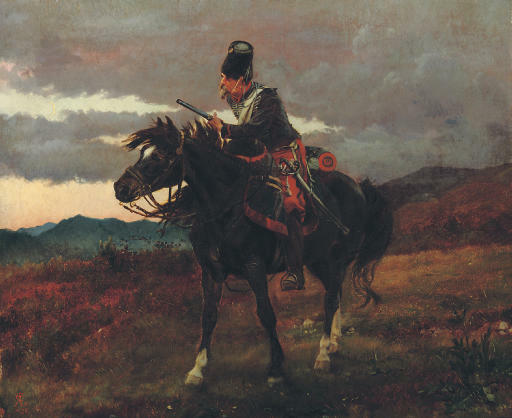 Lady Butler is arguably the greatest British military painter of the 19th Century. She enjoyed an extraordinarily full life. Her parents had been introduced to each other by Dickens, who remained a family friend and was a frequent visitor to the villa on Lake Lugano where she was born. Her sister, Mrs Meynell, became a noted essayist and poet. In 1877, she married Colonel Butler, P.C., G.C.B., and with him she visited Egypt and the Cape before settling in Ireland, where she died at Gormanstown Castle, County Meath, the residence of her daughter, Viscountess Gormanstown. Her formal artistic education began at the age of sixteen: she won prizes at the South Kensington Schools, and travelled to Florence to study under Bellucci. Her first introduction to the army came in 1872 when she observed the Autumn manoeuvres at Southampton. A sketch, Soldier watering horses, was sold to a Mr Galloway of Manchester. He then commissioned The Roll-Call which was considered the picture of the year at the Royal Academy of 1874. It was fêted by the Royal Family, and Mr Galloway was obliged to surrender the painting to Queen Victoria, where it remains in the Royal Collection. Further successes followed: Rorke's Drift was also bought by Queen Victoria while The Remnant of an Army remained the artist's favourite. Chasseur Vedette shows a French light cavalry trooper on picket duty as night begins to fall. French military artists often used the theme of the vedette in depicting a single soldier and Thompson's treatment of the subject may well have derived from Jean Luis Ernest Meissonier's Vedette au Hussards which was exhibited in 1872 at Gambart's French Gallery in Piccadilly and reproduced in The Graphic 1872, p.322. Please note that this lot is an earlier, and slightly larger, version of the picture exhibited at the Dudley Gallery and illustrated in Wilfred Meynell's The Life and Work of Lady Butler.